Bloomsbury Publishers have declared 2012 as The Year of the Short Story and will be publishing a selection of debut and already-published authors this year – publicity stunt or true love of the craft? I'm delighted when the short story gets great publicity! This is definitely Bloomsbury's Year of the Short Story, which is wonderful, and they are to be hugely applauded for publishing not just short story collections but excellent fiction, but I'm not so sure it's a general Year of the Short Story, not much seems to have changed. And also, the danger with a “Year of..” is, well, what happens next year? But I do see that in terms of the tastes of mainstream publishers, is not just short story collections that are unfashionable, there is definitely a much greater conservatism, there's just not the risk-taking that there was. I have enormously talented friends whose novels have not been picked up, and so it's not just short story writers who are having a hard time. But when you take a look at the short story world itself, it's flourishing, it just keeps on and on... it's just not on view, you have to dig a little. How do you explain Britain lagging behind Ireland and the US in terms of short story appreciation and popularity? A matter of taste or availability? I really can't generalise. I have no idea what's going on, apart from, as I mentioned above, a much more risk-averse atmosphere, with short stories being seen, for some strange reason, as risky! I was at the Sunday Times EFG Private Bank short story award ceremony recently (not, sadly, receiving a large cheque!) and it was fantastic to have over 100 people, including many luminaries, toasting the short story at a posh dinner in an Oxford college. I'd like more of that, but this award is a great thing – especially since they make public not just the shortlisted stories but a longlist too, which gives the public more short story writers they can go and hunt down. I do believe the lack of reviews of short story collections is a problem – the review pages of all the weekend papers in the UK seem to be shrinking and shrinking, so everyone's fighting for those inches and short story collections don't often win. How are readers to know what's out there? It's word of mouth too – so us short story lovers need to get out there and shout more about the stories we love, and not just those that we wrote ourselves! I don't believe it's a question of taste – I think that once you read one or two really fantastic stories, you'll be hooked, and readers will understand that there's no either-or, you don't need to be loyal to the novel or the short story, if you love to read, read everything. For some reason quality has become attached to quantity, huge books seem to appear to be better value for money, perhaps. But I truly believe that if you love a good story, the length is not important. There are definitely a lot more literary magazines in the US publishing short stories, but who is actually reading them? I don't know. The mainstream press, apart from the New Yorker, isn't publishing them anymore, not really. I have no answers. Many printed literary magazines have folded or gone digital, and yet innovative publishers such as Ether Books – where short stories can be downloaded on a smartphone application – have been enjoying runaway success. What do you think of this trend? Here to stay? Well, from the list I keep of UK & Irish lit mags, which keeps on growing, I am actually seeing quite a few new print magazines, which does surprise me. I'd rather not get into the prediction business, I think everything's here to stay, there's room for it all. I love a beautiful printed lit mag, but I also love online magazines, especially because it's much easier to share a great story with the world, as I do through #StorySunday on Twitter, which I started to encourage people to promote and link to other people's short stories. 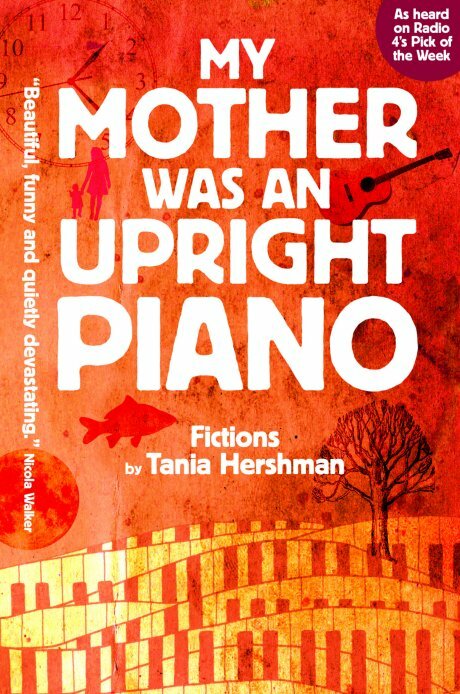 Congratulations on your recent announcement that your collection of flash fiction ‘My Mother Was An Upright Piano’ will be published this spring with Tangent Books. Could you explain the different dynamics of flash fiction vs the short story? Thank you! I have actually not used the term “flash fiction” because in some ways that's just another label. There are many many terms for the very short story, and some readers find them odd or off putting, so I'm avoiding labels entirely and calling my book “fictions”, which I feel is all I can really say: I made this stuff up! The difference for me as a writer is that I can write a complete short short story in one sitting, it comes out in one burst, usually, but I know that's not true for everyone. For me, it somehow circumvents my Inner Critic and so my shorter stories tend to be odder, perhaps, because I am much less inhibited when writing them. But I love the process of writing a longer story, where I write a bit and then I have to wait to see what happens next, which might take weeks. But as for any more, I think the short story can be so many things, and so can the very very short story; one thing I like to do in flash fiction workshops is ask participants what they think might need to be left out when writing a flash story – characters, backstory, description, scenes – and then we look at examples and see that you don't have to leave anything out! There are no rules. You’ve done so much to promote short story readership and help short story writers feel part of a valuable network, have there been any grim moments? Oh yes, quite a few grim moments. When the BBC announced last July that it was cutting the Afternoon Readings, the 15-minute short story slot, which used to be every weekday afternoon, down to one weekday, I was crushed. I really thought, Ok, this is it, no-one wants short stories, and at the same time I had sent initial queries to several literary agents and had no responses at all, so I started seriously thinking about alternative careers. (Luckily it didn't come to that.) I am deeply saddened by the BBC's decision, and I know there are many people working for the organisation that don't understand it – what made it all the more terrible was that the Afternoon Readings were cut so that the news could be extended. One thing we don't need is MORE NEWS. We need stories. As for minor grim moments, there are only so many times you can smile when someone says, “Oh I love to read, but I really don't like short stories,” as if all short stories were the same, one homogeneous entity that could be dismissed, simply because of their length. Grrr. In 2009 your debut collection ‘The White Road and Other Stories’ was commended by the Orange Award for New Writers. How have you grown as a writer since then? I certainly hope so. I wouldn't like to think I'd stopped there. I was thinking recently, as I proofed my new collection, that my first book was actually a collection of pretty much everything I'd written up to that point. But this time round, I had about 150 stories from which I picked my favourite 56, and these, I really feel, more accurately express what I want my writing to be. But then again, I think a writer is always in love with the newest material – the stories in The White Road are over 7 years old. I feel like I am always changing, learning about my writing process, trying new things. I feel that my relationship with language and with words is both looser and tighter - looser because I don't feel constrained by things like full sentences, accurate grammar, I am more interested in reflecting the messiness of our everyday communications, the failures of language. And tighter because I am moving towards greater and greater brevity, saying things in far fewer words, leaving more for the reader to fill in, because those are the kinds of works I like to read. And I write for me. And I don't want to bore myself. It was amazing – really amazing – to be commended by the Orange Award, and I felt it gave me permission to experiment. I don't know how my new book will be received, but I'm very very happy with it. I feel very lucky that I am writing what I love, and mostly love what I write. I know my writing isn't commercial, never will be, I feel grateful any time one other person connects to something I've written. I don't take that for granted, especially as these days I often don't know what my own stories are about. More small publishers seem willing to publish short stories, sometimes in novel formats like Nik Perring’s beautiful ‘Not So Perfect’, or using graphics as you have promised with ‘My Mother Was An Upright Piano’. Do you think that the hand-tailored story collection, produced without market trends or print-runs in mind, could be the new kid on the block? I think small presses are really the short story writer's salvation. They aren't too worried about commercial concerns, they are generally being run by one or two individuals who are passionate about what they do, who invest the book with great care and love, who focus on only a few books at a time, who take risks with format, as you said, and content. No, they don't have marketing teams, PR people, but these days every author, regardless of publisher, has to do so much work anyway. I am in love with small presses, I think we need to nurture them – buy their books! - so that they can keep afloat and be the ones not worried about market trends, the next big thing, W H Smith's 3-for-2s. We decided in the end not to have illustrations in my book, because, as my wise publisher at Tangent said, an illustration of a story would lead a reader towards a particular interpretation of that story, and I prefer to let a reader make up his or her own mind. But there are people doing all sorts of wonderful things with their collections! I once read a comment by a well-known English writer who said that novels were allowed their ‘baggy bits’, whereas in a short story every word counts. Doesn’t that make a novel sound rather imprecise? Do you think many short story writers understand the technical gist of a story? I get angry with novels with “baggy bits”, as a short story lover I think every word should always count, but I know other readers are far more forgiving. I saw a list recently of The 10 Best Novels with Disappointing Endings – now you couldn't have a similar list for short stories, because the ending is paramount, a short story is almost all about its ending, a flash story even more so. I do read an enormous amount of stories, some as first reader or judge of competitions and it does seem that there are many out there who are writing short stories but don't quite know what a short story needs, the narrative tension that will keep a reader reading. It's just a question of reading more, that's how I learn. That's what inspires me. What is the first element of a story or flash fiction that comes to mind for you? A word? A character? A feeling? With short stories I get the first line together with a sort of voice but these days it's more often the narrator's voice than a character. It comes quite strongly. With flash fiction, I often write using prompts, but also it’s the words that come. No plotting! Never any plotting – it's me I'm telling the story to, I don't want to know what's going to happen! 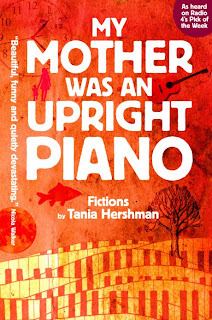 Many thanks to you Tania and best of luck with ‘My Mother Was An Upright Piano’. Tania is everywhere! I came here from Christopher Allen's blog where she's been interviewed also, a tad more intimately and personal. This interview is different but just as good and interesting. One thing that is different on the Continent, or at least in Germany: mainstream publishers love short stories and they publish a lot of short story collections. Alas, that's of no relevance to me since I only write in English, but what the heck. If someone can make it work commercially, others will, too. Cheers from Berlin!